Happy Thanksgiving! I hope everyone that is celebrating in the US has a wonderful day! My husband works in the healthcare field so he works every Thanksgiving, so we'll have our feast this evening when he gets home. Our oldest is the only one of our kids that still lives in the area so he's also coming over to hang out and have dinner. He works retail so has to be at work at midnight to prepare for Black Friday, boooo! 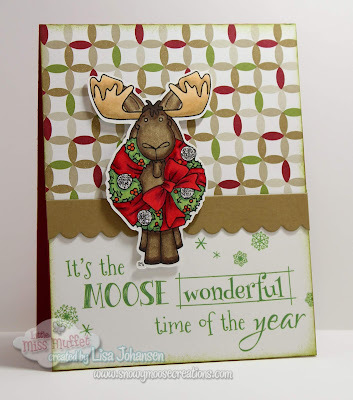 It's Inspiration Week over at the Little Miss Muffet Stamps blog and this week I'm using one of the fabulous moose images, Moose Cheer, and the Moose Wonderful Time sentiments for my card. I just love this moose with the big wreath around his neck! I colored it with my copics and then used silver Stickles to create my ornaments. Normally this time of year I'd be seeing a bunch of moose in my yard and neighborhood but thanks to the stupid warm blob in the Pacific Ocean (look it up if you don't know what I'm talking about) our weather here in southcentral Alaska has been very warm and we have no snow, so the moose are staying up in the hills. It's pretty depressing! Good thing I have this image to help lift my spirits a bit! 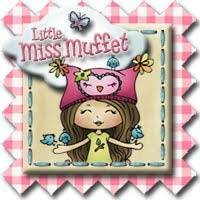 Don't forget, there is still time to play along in our Anything Goes challenge, so head on over to the Little Miss Muffet Stamps blog and join us!